Quickly transfer media from your Panasonic P2 cards to your computer over super quick thunderbolt. Sonnet's Thunderbolt Pro P2 Card Reader quickly transfers files from Panasonic P2 memory cards to your computer with Thunderbolt ports on location, in the studio, or in the edit suite. This single-slot reader's ability to transfer data from P2 cards at much higher speeds than USB 2.0 card readers are capable makes for a significantly more convenient and efficient workflow. Its value price makes it the most cost-effective P2 card reader available! 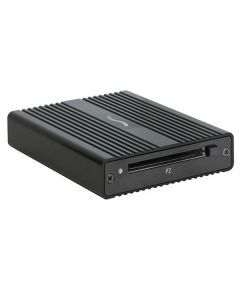 The Thunderbolt Pro P2 Card Reader is compatible with any Mac with a Thunderbolt port and connects directly to your computer or at the end of a Thunderbolt device chain. The reader supports all P2 memory cards and frame rates, and supports microP2 cards with an adapter (sold separately). Measuring a compact 3.6 inches wide by 1 inch high by 4.5 inches deep, the Thunderbolt Pro P2 Card Reader is the smallest P2 reader available, making it perfect for use anywhere space is tight. The reader's shell is made from extruded aluminum, making it lightweight, and yet rugged enough to be transported in an equipment bag without fear of cracking the case. Sonnet includes a Thunderbolt cable for directly connecting the card reader your system.